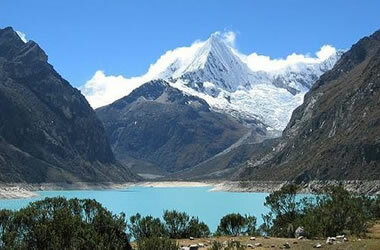 Lake Paron 4185masl is the largest lake in the cordillera blanca, on the Peruvian Andes, 32km east from the city Caraz. Its nested and surrounded by several snow peaks such as Aguja I 5840masl, Aguja II 5888masl, Caraz I 6025masl, Caraz II 6020masl, Caraz III 5720masl, Artesonraju 6.025, Paria 5600masl, Pyramid 5885masl, Chacraraju West 6112masl, Chacraraju West 6356masl, Pisco 5772masl, Huandoy East 6000masl, Huandoy North 6395masl, and Huandoy West 6356masl, its one of the most popular areas for climbing in Peru, including the so famous the Sphinx 5325masl a granite monolith, offering at least 13 big wall routes. The Paron lake formed as a natural reservoir has a catchment area of 44.3km2, it is 3.7km long from east to west and average of 7000m width from north to south, the original depth was about 75m, but today the level was lowered 15m to prevent the collapse of the moraine, the water from the lake was formerly used for the canon del pato hydroelectric scheme, since 29 july 2008, this condition has ceased. 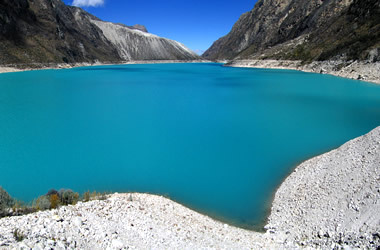 The lake itself is within the borders of the Huascaran National Park. The water level is controlled by a tunnel and underwarter gate, to keep water level at 4155masl aiming a double objective to prevent the overflow and the resulting risk for the downstream population and to manage the river discharge. Breakfast in the Hotel around 6am and depart with private minivan around 7am, at direction to North side along the Callejon de Huaylas valley, our tour will start in Huaraz 3100masl. then pass the typical small village of Paltay, Tarica, cross the Rio Santa to left side pass several typical villages Jangas, Yungar, Anta where from here we can appreciate the beautiful white mountains Huandoy, Huascaran, Hualcan, Copa and others, you may make a photo-stop point of view, continue pass the Marcara district, continue to Carhuaz some can walk around the Plaza de Armas, carhuaz is located at 2650masl, continue to the Historical province of Yungay the ancient buried city at 2500masl, piece of Huascaran mountain north peak broke and made a huge avalanche mud and ice blocks and in 6 seconds destroyed Yungay province, guided visit will take you around 45 minutes, then 1km north side is located the new yungay, then continue to Caraz small city. start the unpaved trail going up along the Paron River full of eucalyptus trees and typical houses of peasants, then in a few minutes we will start driving up by a wonderful valley full of polylepis trees called quenuales, then arrive to Paron lake and enjoy walking around the lake short hiking to the top of the lake, enjoy time taking pictures and so, then at proper time return to Caraz by the same route for lunch in a typical restaurant around 3pm then after lunch drive back direct to Huaraz arriving around 6pm.